Fans of the "Old Skool" classic Reactivate sound, need to hold on to your hats. James Black Presents has entered the building and he delivers a track rinsed with old skool feel brought bang up to date. James Black has a strong signature DJ sound and knows exactly what he likes. Time to Die is not only what he likes - its what we like too. The gated riffs and twisted bottom end drive Time to Die forward disarming the listener and pulling them in to its unrelenting drive. With a tune such as this, Oberon was our natural choice when it comes to remix duties. Sticking closely to the theme but with all the Oberon trademarks from a DJ and producer that knows more than pretty much everyone else on the planet when it comes to hard dance. Simply put, he smashes it out of the ball park and Discover Dark finishes the year on the hardest of all highs!! 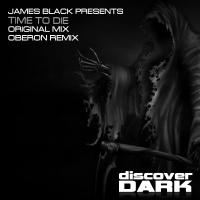 'Time to Die' is available now from Beatport and iTunes.